In the early days of Gold Systems, I joked that someday CTI would stand for "Computer Telepathy Integration" and we would just think about what we want to do on the computer and it would happen. That was almost 21 years ago, and over the last five years I've been seeing signs that this will actually happen in my lifetime. Or rather is happening. The latest example was reported in the May 16, 2012 article by Benedict Carey in the New York Times Science section. (You can try this link if you are registered on the site) The article talks about the first published demonstration about how people with brain injuries have been able to control a prosthetic arm. In other words, they can no longer control their own arms, but they are able to control a robotic arm, just by thinking about it. This has been reported in Nature, and can be found here. This technology is in the lab today, and requires "a tiny sensor about the size of a baby aspirin" to be injected just below the skull. I've got to think a wireless sensor will come along at some point, and I hope that it will find its way into the real world quickly. This photo says it all, which the New York Times credited to braingate2.org. Be sure and check out the BrainGate website for more information about the technology and photos of the amazing team who is making this dream a reality. This week Anthony Hannigan emailed me an article about some new software by Microsoft Research. According to the Seattle Tech Report, the software called Songsmith was to go on sale on Thursday and would be available through Microsoftstore.com The software was supposed to be able to record someone singing into a microphone, and then it would figure out the appropriate chords and create a backing track for the vocals, including guitars, drums, keyboards, strings and whatnot. Presto chango, you too can be a rock star. It sounded too good to be true, so I plunked down my $29.95 and downloaded my very own copy three days before it was supposed to go on sale. I spent a little time with it last night and didn't get great results. (If you've already watched the video, you might argue that I STILL haven't got great results!) Due to some technical problems with my microphone and interface, which is my problem, not Songsmith's, I couldn't get anything interesting to happen with vocals, but then I realized that the software also works with guitar, keyboards and probably any musical input. After a long day at work I came home tonight and as I often do I relaxed by fooling around with a guitar. Next thing I knew I had the tune and video above. Recording the music took at most 10 minutes. Using Windows Movie Maker took another hour as I futzed around with the photos and titles. I haven't talked much here about my secret life of music, but it's every bit as important to me as being an entrepreneur and playing with technology. When the three overlap, I go into the zone and come out hours later happy and ready to go again. I'm impressed with Songsmith, and I'm looking forward to how it evolves. Over ten years ago I played with The Axe software by Harmonix. The idea there was that non-musicians could create music by twiddling controls on their computer. It didn't get much attention, but that company went on to create Guitar Hero. I believe that everyone should have the chance to play music, so while I'm sure some musicians will write this software off as being a toy, I'll bet others will take it and come up with some great songs. And if it gets a few people to put down their plastic guitar, turn off the TV and step up a bit to making real music, then the developers will have done a great service to the world. If you want to learn more about Songsmith, click here to visit the Songsmith team web site. If you have any interest in the business of life sciences, check out Adam's blog Colorado Life Science Deal Flow. John Weller left the Falkland Islands this morning on a Russian icebreaker, bound for a 38 day trip to Antarctica. I've updated the Lastocean.org blog for John, and I'm expecting frequent updates and the occasional photo during the trip. I wrote about the Last Ocean project in my post, One last place we haven't screwed up. 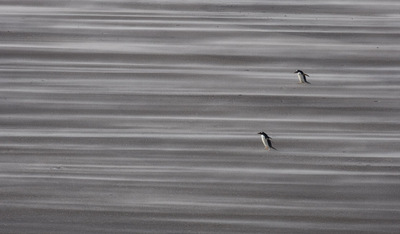 John's been camping within walking distance of four penguin colonies on Saunders Island for the last 12 days. He called me yesterday to give me an update and he's very excited. I'm still amazed at how quickly our world of telecommunications has advanced. The call sounded as if John was next door, though there was a slight delay and it did cost $4 a minute. He also said (after his first phone card ran out) that it took him fifteen minutes to get an outside line, but it's still amazing that it's even possible. He also emailed me a couple of photos from an Internet cafe. Shackleton wouldn't know what to think about all of this. In my update on the Last Ocean blog, I mentioned my good friend Herb Morreale and his new blog about Domino Theory. Check it out. This is something Herb's been working on for years and once you get the idea, you'll be seeing Dominoes everywhere and wanting to be one yourself. Here is another of John's photos - I can't wait to see the new portfolio. Photographs are copyright John Weller, 2007. In my last post, I told the story of meeting John Weller, an amazing guy who's part of a team that is making a great effort to make the world a better place. The post was titled, "One last place we haven't screwed up" and it's just the beginning of the story. I asked John how I could help, and I signed up for two jobs. One is to help him fund some of the effort, and I'll be writing more about that soon. The other job I took on was to help him get a blog going while the real website is under construction. It occurred to me that there is email access even in Antarctica, so I suggested to John that he could send me updates while he's there and I would edit and post them so that people could go along on the journey via the Last Ocean blog. 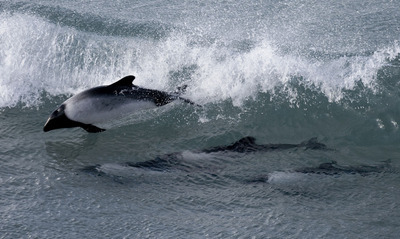 I hope you'll subscribe to the blog at lastocean.org, and follow along. John's going to be camping out in the Falkland Islands over Thanksgiving, and then he'll head on down to Antarctica. You might remember him as you are sitting down for dinner - he and the team are doing great work. Check out the latest at lastocean.org. My good friend Verna at Integrity Arts told me just before I went on vacation that she had a new client that I just had to meet. Wow, was she right! John Weller is a photographer and author who has decided to change the world, if not actually save the world. He's making great progress. He dropped by today and we ended up spending three hours together looking at photographs and talking about The Last Ocean Project. I immediately signed up to help and I hope you will too. John's given me permission to use a few of his photographs, but trust me - you have to see them in person to really appreciate them. 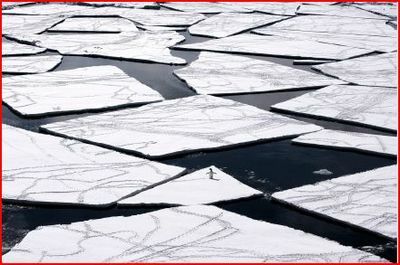 This is a photo of sea ice in the Ross Sea in the Antarctic that John took on his last trip. What I didn't realize until today is that this is pretty much the last place on earth that we haven't screwed up. It's the one place in the world where we can imagine that all is right with the world. It's the one place where scientists can go and study ecosystems that are pristine. It's where the penguins live! It can be overwhelming to think about all the places in the world that need to be cleaned up and put right again. But here's a place, and an important place, that all we have to do is not screw it up in the first place. Sounds easy, but it's going to take a great effort. Until recently the Antartic and the Ross Sea were just to hard too get to. 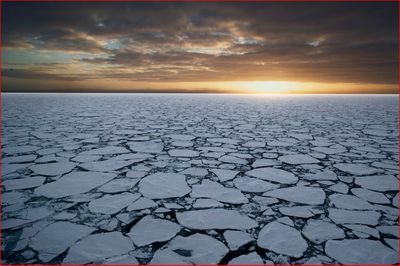 Where have you heard about the Ross Sea you wonder? Think Sir Ernest Shackleton. But the push to put one more fish on your sushi plate has created an incentive for companies to figure out how to fish the last frontier. John has a degree in Environmental Economics, so he knows there is a price to be paid for harvesting or protecting the environment. He looked like a meat-eater to me, so I know he doesn't want to ban all fishing; he just wants to save this last little piece of the earth from exploitation while working with the fishing industry to fish elsewhere in a sustainable way. Luckily there are people like John who have stepped up to lead the effort. He's already brought together an impressive group of scientists, educators and corporate sponsors. 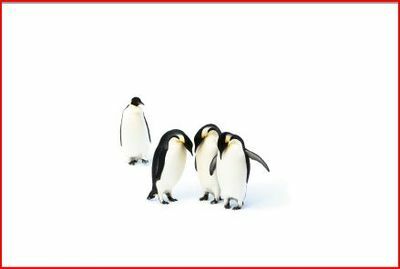 He's preparing to go back to the Ross Sea to do the underwater photography for his next book while working with scientists to write the recommendations for the politicians to do the right thing here. And he's working with a group that is putting the finishing touches on a fantastic looking website AND he's working with educators to get the facts out about this amazing part of the world. I felt like a slug sitting there thinking about what this guy's doing to make a big difference in the world. John's most immediate need is a commitment of $10,000 to finish off this round of fund raising. I realize the NPR pledge drive just finished, but this is important. I'm going to help, and if you can help too, email or call me. I'll put you together with John and you will see why I'm so enthusiastic about his project. I'll be writing more about this soon.